Your latest middle grade novel, Jasper and The Riddle of Riley’s Mine, was just released this past February. Is this your first novel that is not written in verse? Tell us about this new historical adventure – what is Jasper & the Riddle of Riley’s Mine about? How did you capture the voices of Jasper and Melvin? I just noticed that you have a new picture book on the Pony Express coming out this fall, yes? I saw that you taught Social Studies and English. A lot of our listeners who are teachers and librarians and homeschooling parents are always trying to find ways to connect subjects to really maximize the limited time we all have. When you were teaching full time, how were you connecting social studies and English? Is there anything that you used to do as a teacher that now, looking back – you regret? Anything you would go back and change? Even though you aren’t in the classroom anymore, your passion for connecting readers and educators with the right book is clear. I especially love the “Classroom Connections” section on your website where you interview authors about their books and include a specific section on how that book would be a good fit in a classroom. How do you think that we as parents and teachers can raise kids who love reading? How is having a teenager reader different than having a middle grade reader at home? As someone who has gone through those years and is now out the other side, what can we expect? Which book characters are you a composite of? In this section of the show, I share with you a few books centered around a theme and discuss three things to love about each book. This week, with Father’s Day coming up, I thought I would focus on books with great dads. I know it’s such a trope with kids books that the parents get killed off or are otherwise out of the picture so that the main characters can go off on adventures unimpeded, but we’re breaking away from those books today. First, I’ll go into some detail about two newer releases that I have been loving – Amina’s Voice and Beyond the Bright Sea. And then chat about other favorite dads from both modern and classic books. Amina’s family! Her father – who is rather strict, does NOT care if he embarasses his kids by asking a million questions at Open House, but stands up for his daughter at a moment when she needs it. At first I wasn’t sure about him, but oh he grew on me! Her mom, who spends days preparing tons of traditional Pakistani food for their visiting uncle. That doesn’t quite go as planned. And Amina’s older brother, Mustafa, whose interest in trying out for the basketball team instead of joining something like Chess Club causes some friction at home. There was so much to relate to in those family moments in Amina’s Voice. That ending! I don’t want to give away too much but something bad happens in Amina’s Muslim community and the way things come together in the end makes me wish that every kid could read this story as a template of what to do in that kind of situation. It didn’t shy away from difficult realities or make problems seem easy to solve yet it was uplifting and perfect. That this novel offers Muslim students and students from the Middle East with a main character whose background and customs might be a reflection of their own, or have pieces they can relate to. I so wish that I had this book six years ago to offer to my own Amina. She was a student of mine when I taught 6th grade and Muslim. And may have connected to this Amina’s story but she was from Bosnia so although the religious details about the Imam and Sunday school and learning passages from the Quran may have been a connection, the food and other cultural details might not have been. So while this book is absolutely a great addition to any library, I just hope that people don’t stop there and think they’ve covered a niche. 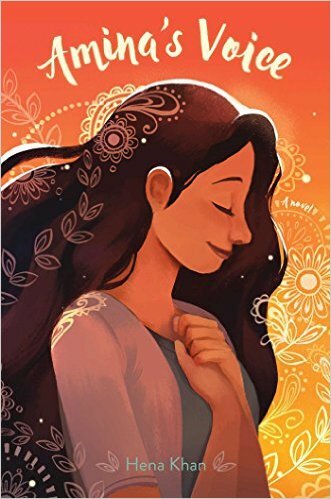 It’s one girl’s story and I just can’t wait to see what else this new imprint of Simon & Schuster, Salaam Reads, will bring to the kidlit community so we have more and more stories to offer kids. 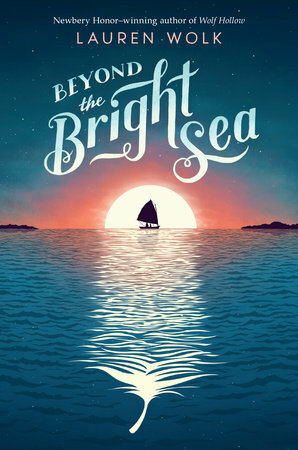 Our second book this week is Beyond the Bright Sea by Lauren Wolk whose novel Wolf Hollow won a Newbery Honor last year. And this book is, I think, another contender. It reminded me a little bit of The Guernsey Literary and Potato Peel Pie Society with a touch of Orphan Island in there. This book about a 12 year old girl called Crow who as an infant washed ashore in an old boat on one of the Elizabeth Islands off the coast of Massachusetts. She is now 12 and being raised by a reclusive fisherman and painter who she calls Osh. And the other people on this tiny close-knit island essentially shun her and will not touch her or touch anything she has touched because they think she came from Penikese Island – the nearby leper colony. And this chain of events suddenly takes off when Crow sees a fire on that nearby island and starts to get curious about where she came from. It’s so good! Here are three things to love about Beyond the Bright Sea. The timeless quality of the setting. It reminded me of Pax in that way because there are very few clues at first in the way the islanders dress or how technology is described. Eventually, you do discover precisely when everything is happening but the journey of figuring that out is part of what I liked about the book. It brought to light some real history. It took me until half-way through to realize that the leper hospital described in the novel actually existed. And they did really dynamite it and burn it down and transform it into a bird sanctuary for awhile. But the small cemetery does remain. I love a book that brings to light a forgotten story from history. Crow’s adoptive father who she calls Osh. He has his own secrets, his own complicated backstory, but his quiet, earnest protection of her makes you love him immediately. He’s from another land, speaks in a native language that no one on this New England island knows and we really feel for him as he is so deeply afraid of losing Crow – the one thing that has keep him anchored and steady. And as she ventures out to attempt to find her parents, it’s hard for him at first. And – I don’t want to spoil anything for you but oh when you find out what his name means…. Love him! Both Amina’s Voice and Beyond the Bright Sea are outstanding reads. If you have a kid who enjoyed Finding Perfect or Like Magic or Sticks & Stones – Amina’s Voice would be great next book to introduce them to. And if you have a child who enjoyed Midnight Without a Moon or Wolf Hollow – Beyond the Bright Sea might be the perfect next book. And one new book that came up over and over again and one that has been a classroom favorite with my 5ths is The Crossover – what a great relationship he had with his twin boys. Another book that was mentioned a lot was The Family Fletcher series and the two awesome dads heading up that family. I haven’t read it yet but that title is moving up my TBR list. Melanie Conklin’s Counting Thyme and the newly released Moon Shadow by Erin Downing are both books that I’ve been dying to read that so many mentioned as having a great fathers. The dad from Gertie’s Leap to Greatness and the dad in The Penderwicks and Mr. Pullman from Wonder and the dad from Ida B and Wolf Hollow! I know there are tons and tons more – so I hope you jump on social media share your favorite middle grade dads!